Films such as Gladiator, Braveheart, and Attila the Hun and books on peoples such as the Vikings and Celts are drawing attention to the ancient peoples of Europe. With the end of the Cold War, there is also renewed interest in the peoples formerly behind the Iron Curtain, such as the Kosovars or Estonians. Other peoples, like the Basques and Walloons, continue to be in the media, although the historical context for the present conflicts is often not well understood. 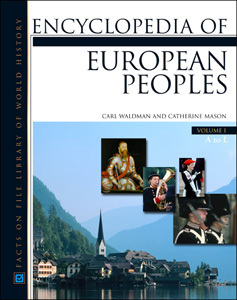 Encyclopedia of European Peoples is an A-to-Z reference to the peoples of Europe, from ancient to modern times, summarizing their origin, language, history, culture, and relationship to other peoples. This encyclopedia includes entries on all peoples that have at one time maintained a cultural identity. Thus, the reader will be able to find entries on the Gauls and Normans, but also an entry on the "French: nationality," that describes who they are today with cross-references to the various ancestral peoples. Main entries begin with a fact sheet and a timeline and conclude with a further reading section. Sidebars are placed throughout, outlining the biographies of individuals critical to the shaping of European history, and approximately 200 black-and-white photographs, illustrations, and maps add to the engaging text. Contents include a master alphabetical list of entries, with alternate names and language families or other classifications; entries organized by language family, ethnicity, nationalities, or regions; a table listing the languages of Europe, past and present; a summary of the geography of Europe; a summary of the prehistoric hominids once inhabiting that continent; a list of individuals mentioned in the text, organized alphabetically according to European peoples; and an alphabetical list of those individuals featured in biographical sidebars, citing the entries where the sidebars are located. A chronology of European prehistory and history, a glossary of cultural terms, and a general bibliography—with general titles on European history and culture, prehistory, and ancient writings—also supplement the text. An index offers the reader additional access to the information. "...provides remarkably detailed entries for Europe's peoples...Recommended." "A great resource for global-history classes or students looking into European cultural identity." "...a worthwhile set for any library to obtain." "...a unique reference because it approaches the study of each country from its peoples, giving students a greater understanding of the peoples and their cultures."